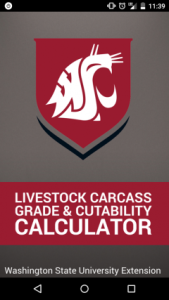 WSU Livestock Carcass Grade & Cutability Calculator is a simple way to calculate carcass yield grade, dressing percentages, and cutability of beef, pork and lamb carcasses. 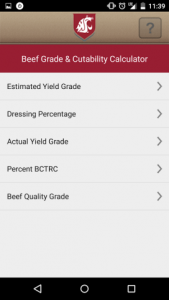 Individuals can estimate yield grade or cutability from live animal data from cattle, pigs and lambs, in addition to calculating the actual dressing percentage and cutability for beef, pork and lamb carcasses from carcass data. Just enter live or carcass data information and the Livestock Carcass Grade and Cutability Calculator will calculate the yield and percentages. For cattle the Beef Carcass calculator will calculate estimated yield grade, dressing percentage, actual yield grade, percent retail cuts, and assist in determining USDA quality grade by reviewing USDA degrees of marbling standards for A maturity cattle carcasses (less than 30 months of age). For pigs the Pork Carcass Calculator will calculate estimated percent muscle, dressing percentage, and actual percent muscle for both ribbed and unribbed carcasses. The Pork Carcass Calculator allows one to correct for skin on or off and if the head has been removed from the carcass. For lambs the Lamb Carcass Calculator will calculate estimated yield grade, dressing percentage, actual yield grade, and percent of boneless closely trimmed retail cuts. 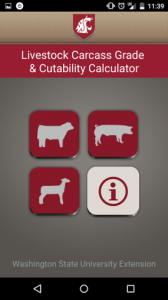 The WSU Livestock Carcass Grade & Cutablity is an excellent way for producers, niche marketers, butchers, livestock judges, meat evaluators, and youth to quickly determine the yield grade and cutability of beef, pork or lamb carcasses. This tool is not meant to replace or verify USDA grades determined by USDA graders or grid pricing used to determine carcass value by specific cattle/carcass buyers. The information given herein is for educational purposes only. Reference to commercial products or trade name is made with the understanding that no discrimination is intended and no endorsement by Extension is implied. Washington State University Extension programs and employment are available to all without discrimination. Evidence of noncompliance may be reported through your local WSU Extension Office.